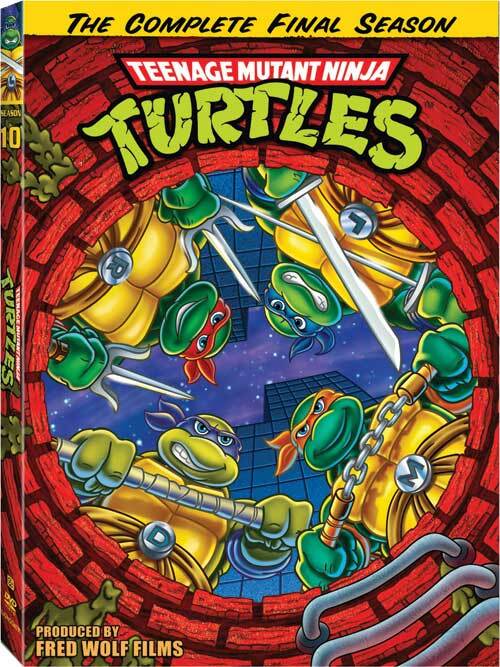 Leonardo, Donatello, Raphael and Michelangelo are back in the classic final season that pits turtles from the past and present against the evil Lord Dregg and his minions. Determined to enslave mankind, Dregg will stop at nothing to win: causing a piece of the sun to crash into Earth, opening a giant portal to pull the planet into Dimension X, and even draining the life energy from the Teenage Mutant Ninja Turtles! Carter soon realizes that the only way to defeat Dregg, Krang and Shredder is to bring the Turtles’ past selves to the present…doubling the Turtle power! But will they make it in time before Dregg’s invasion is complete? Featuring time-warping serious Turtle muscle, season 10 is a totally tubular finale! August 14th, 2012 sees the end whenTeenage Mutant Ninja Turtles – Season 10 hits stores from Lionsgate Entertainment. This single-disc release with the last 8 episodes will cost $14.98 SRP, and includes Exclusive Interviews with select animators who were behind these iconic cartoons, as well as 2 bonus never before released episodes (Once Upon A Time Machine and Planet of the Turtleoids).